How can we become better disciples during Lent? 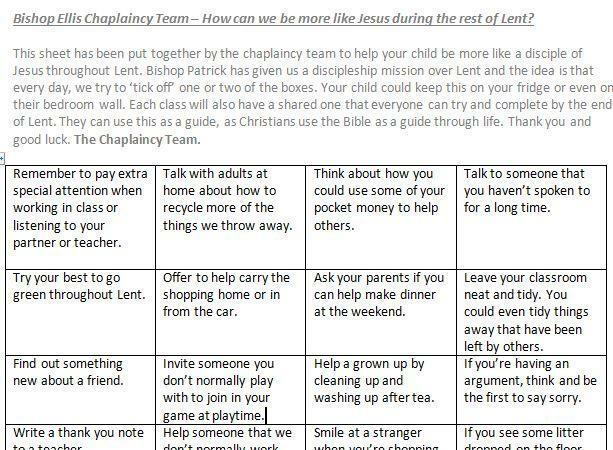 Earlier today, we (the Chaplaincy Team) visited each of the classes to give them our updated ideas about how we can become better disciples during Lent. Bishop Patrick asked everyone in our parishes to make an extra special effort and talking to the classes, all of the children are trying really hard. We've asked everyone to try and tick off as many of the discipleship ideas as they can. They can keep the ideas on the fridge at home or even stick it up in their bedrooms. We want Bishop Ellis children to help make our school, homes and world a nicer place to be and so please click this link if you want to download it. Thanks. The Chaplaincy Team.